In 1945, Pick Heaters developed and patented a unique concept of Direct Steam Injection (DSI) Heating. It was the first step in what was to become a continuous flow of refinement and innovation. It is this design philosophy that has Pick at the heart of heating for over 70 years in industries ranging from food to chemical and pharmaceutical processing, pulp and paper to power plants. Pick is the only DSI company to offer a true Variable Flow design for multiple use points and on/off applications. Pick’s BX heater is truly innovative. Its open design allows slurry flow without obstruction, at negligible pressure drop. The BX heater is used for industrial starch cooking and slurry heating. Pick’s fabricated heaters allow for flow rates and pressures far above the norm – up to 25,000 gpm or 1,400 PSIG. They also conform to existing piping from 1/2 to 32 inches and greater, and in various materials of construction. Pick was the first direct steam injection company to introduce a 3A certified Sanitary Heater in 1984 and was also the first DSI company to offer a pilot scale version especially for R&D. 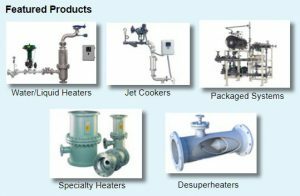 Over 20 years ago Pick expanded its scope of supply to include packaged systems including skid mounted pumps, instrumentation and other ancillary equipment coupled with the Pick direct steam injection heater to meet customer’s needs. Now, through PCD (Pick Custom Design) you can combine Pick’s experience in heat transfer with their packaging capability to meet all your process heating needs – using various heat transfer methods.